Nuchal translucency/free beta/PAPPA screen (aka "1st Trimester Combined Test") 10–13.5 85% 5% Uses ultrasound to measure Nuchal Translucency in addition to the freeBeta hCG and PAPPA (pregnancy-associated plasma protein A). NIH has confirmed that this first trimester test is more accurate than second trimester screening methods. Performing an NT ultrasound requires considerable skill; a Combined test may be less accurate if there is operator error, resulting in a lower-than-advertised sensitivity and higher false-positive rate, possibly in the 5-10% range. Integrated Test 10-13.5 and 15–20 95% 5% The Integrated test uses measurements from both the 1st Trimester Combined test and the 2nd trimester Quad test to yield a more accurate screening result. Because all of these tests are dependent on accurate calculation of the gestational age of the fetus, the real-world false-positive rate is >5% and maybe be closer to 7.5%. ↑ 1.0 1.1 1.2 1.3 1.4 Weijerman, ME; de Winter, JP (Dec 2010). "Clinical practice. The care of children with Down syndrome". European journal of pediatrics. 169 (12): 1445–52. doi:10.1007/s00431-010-1253-0. PMID 20632187. ↑ 2.0 2.1 2.2 2.3 Patterson, D (Jul 2009). "Molecular genetic analysis of Down syndrome". Human Genetics. 126 (1): 195–214. doi:10.1007/s00439-009-0696-8. PMID 19526251. ↑ Morris, JK; Mutton, DE; Alberman, E (2002). "Revised estimates of the maternal age specific live birth prevalence of Down's syndrome". Journal of Medical Screening. 9 (1): 2–6. PMID 11943789. ↑ "How do health care providers diagnose Down syndrome?". Eunice Kennedy Shriver National Institute of Child Health and Human Development. 2014-01-17. Archived from the original on 7 March 2016. สืบค้นเมื่อ 4 March 2016. ↑ 6.0 6.1 6.2 "Facts About Down Syndrome". National Association for Down Syndrome. สืบค้นเมื่อ 20 March 2012. ↑ 7.0 7.1 7.2 7.3 7.4 Malt, EA; Dahl, RC; Haugsand, TM; Ulvestad, IH; Emilsen, NM; Hansen, B; Cardenas, YE; Skøld, RO; Thorsen, AT; Davidsen, EM (Feb 5, 2013). "Health and disease in adults with Down syndrome". Tidsskrift for den Norske Laegeforening : Tidsskrift for Praktisk Medicin, NY Raekke. 133 (3): 290–4. doi:10.4045/tidsskr.12.0390. PMID 23381164. ↑ 8.0 8.1 8.2 8.3 8.4 Kliegma, Robert M. (2011). 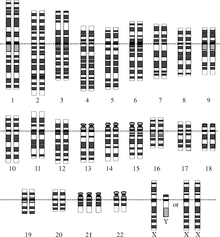 "Down Syndrome and Other Abnormalities of Chromosome Number". Nelson textbook of pediatrics (19th ed.). Philadelphia: Saunders. pp. Chapter 76.2. ISBN 978-1-4377-0755-7. ↑ Steinbock, Bonnie (2011). Life before birth the moral and legal status of embryos and fetuses (2nd ed.). Oxford: Oxford University Press. p. 222. ISBN 978-0-19-971207-6. Archived from the original on 2017-01-23. ↑ Szabo, Liz (May 9, 2013). "Life with Down syndrome is full of possibilities". USA Today. Archived from the original on 8 January 2014. สืบค้นเมื่อ 7 February 2014. ↑ 16.0 16.1 16.2 16.3 16.4 16.5 16.6 16.7 Hickey, F; Hickey, E; Summar, KL (2012). "Medical update for children with Down syndrome for the pediatrician and family practitioner". Advances in Pediatrics. 59 (1): 137–57. doi:10.1016/j.yapd.2012.04.006. PMID 22789577. ↑ 21.0 21.1 21.2 21.3 21.4 21.5 21.6 21.7 Epstein, Charles J. (2007). The consequences of chromosome imbalance : principles, mechanisms, and models. Cambridge: Cambridge University Press. pp. 255–256. ISBN 978-0-521-03809-6. ↑ Daniel Bernstein (2012). Pediatrics for medical students (3rd ed.). Philadelphia: Wolters Kluwer Health/Lippincott Williams & Wilkins. p. 259. ISBN 978-0-7817-7030-9. ↑ Tecklin, Jan S. (2008). Pediatric physical therapy (4th ed.). Philadelphia: Lippincott Williams & Wilkins. p. 380. ISBN 978-0-7817-5399-9. ↑ 25.0 25.1 Perkins, JA (December 2009). "Overview of macroglossia and its treatment". Current opinion in otolaryngology & head and neck surgery. 17 (6): 460–5. PMID 19713845. ↑ Wilson, Golder N.; Cooley, W. Carl (2006). Preventive management of children with congenital anomalies and syndromes (2 ed.). Cambridge: Cambridge University Press. p. 190. ISBN 978-0-521-61734-5. ↑ Lana-Elola, E; Watson-Scales, SD; Fisher, EM; Tybulewicz, VL (Sep 2011). "Down syndrome: searching for the genetic culprits". Disease models & mechanisms. 4 (5): 586–95. doi:10.1242/dmm.008078. PMC 3180222. PMID 21878459. ↑ 28.0 28.1 28.2 Nelson, Maureen R. (2011). Pediatrics. New York: Demos Medical. p. 88. ISBN 978-1-61705-004-6. Archived from the original on 2017-01-23. ↑ 29.0 29.1 Howard Reisner (2013). Essentials of Rubin's Pathology. Lippincott Williams & Wilkins. pp. 129–131. ISBN 978-1-4511-8132-6. Archived from the original on 2017-01-23. ↑ "CDC—Birth Defects, Down Syndrome—NCBDDD". Cdc.gov. 2013-11-06. ↑ Kausik Mandal (2013). Treatment & prognosis in pediatrics. Jaypee Brothers Medical P. p. 391. ISBN 978-93-5090-428-2. ↑ 35.0 35.1 35.2 35.3 35.4 Michael Cummings (2013). Human Heredity: Principles and Issues (10 ed.). Cengage Learning. p. 138. ISBN 978-1-285-52847-2. ↑ 37.0 37.1 Menkes, John H.; Sarnat, Harvey B. (2005). Child neurology (7th ed.). Philadelphia, PA: Lippincott Williams & Wilkins. p. 228. ISBN 978-0-7817-5104-9. Archived from the original on 2017-01-23. ↑ NIH FASTER study (NEJM 2005 (353) :2001). See also J.L. Simplson's editorial (NEJM 2005 (353) :19). หน้านี้แก้ไขล่าสุดเมื่อวันที่ 15 พฤศจิกายน 2561 เวลา 12:40 น.